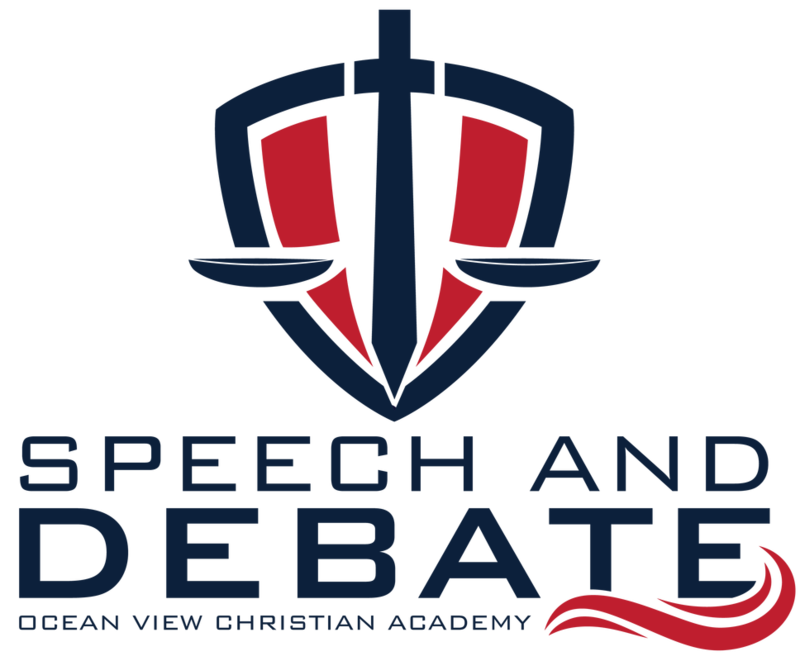 Students participating in OVCA Speech and Debate are 9th-12th graders who desire to push themselves academically while having a blast stretching their ability to reason and engage. A speech and debate student should be a self starter and someone who thrives on achievement. There is no cost to participate in the Speech and Debate Team. There will be nominal individual entry fees for tournaments. Speech & Debate can increase critical thinking skills by as much as 44% (Akerman, 2011). Students learn to think analytically and logically. Students who participate in speech & debate on average score 25% higher than their peers (Mezuk, 2010). Debaters also score better on the SAT and ACT than their peers (Fine, 2001). The #1 fear in America is public speaking, yet students who participate in speech & debate learn to love public speaking and enjoy it. Speech & debate teaches students to be organized, have persuasive delivery, and demonstrate confidence when addressing large groups of people. Students who participate in speech & debate become natural leaders. They learn to think for themselves, and communicate well with others. They also become responsible for their own success and typically go above and beyond what the teacher requires. One study found that high school debate decreased disciplinary problems among participants by 50 percent (Glanton, 2005). Competing in speech & debate requires students to learn to respectfully disagree with opponents. Students learn how to listen to those who disagree with them, and have intelligent, respectful dialogues on controversial issues. Today’s students will soon become witnesses to those they encounter at college or the workplace. While it is crucial that the next generation have a strong Christian worldview, it is also important for them to be able to both communicate and defend this worldview. Debate allows these young adults to learn and hone their communication skills in a friendly, Christian environment. Students compose and memorize a ten-minute non-fictional speech on any topic or issue, and then deliver it, keeping in mind the aspects of quality public speaking. This speech is meant to persuade or inspire a change of heart or mind. A persuasive speech in which the speaker writes and presents an issue and advocates a legal solution. An original speech in which the speaker informs the audience about a topic of choice. Students may use visual aids/posters. Involves the selection, preparation, and presentation of a seven minute max. speech on a topic relating to United States domestic and foreign policy, domestic commerce, politics, economy, and the like. During the speech, both the oratorical and persuasive aspects of the presentation are emphasized-and the speech is to be delivered entirely from memory. During the thirty-minute preparation, references may be made to magazine and newspaper articles retrieved from files compiled during the season. Follows much the same style as National Extemporaneous, but it deals with the analysis of foreign politics, economics, and the like. This event involves memorization and performance of a ten-minute dramatic "cutting" from a play, novel, or movie script. The performer may play one or more characters and will be judged on how well they interpret them. This event is quite similar to Dramatic Interpretation, with two major distinctions. The first is that the ten-minute cutting should be humorous by nature, and the second is that monologues are frowned upon in this event. The student is judged based on the character distinctions and creative interpretation. This event involves two performers presenting a 10-minute segment of a play. Like Humor and Drama above, they may perform one or several roles. Performers may not look at or interact directly with one another. Acting is expected, but the performers must synchronize their movements. Competitor presents 3 or more different pieces tied together with a theme. Students will hold a binder with the pieces throughout the presentation. Competitors write their own material in the form of their choice. In can be funny, dramatic, or a combination of both, poetry or prose. Participants must memorize and present a ten-minute speech written by someone other than the presenter. This could range from famous speeches or the Original Oratory piece of a previous participant. ​Learn to be a mock senator or congressperson by writing legislation and then trying to pass them in a debated session of “Congress.” These students will also be competing in other events to strengthen speaking and preparation skills as well as maximize their talents. Competitors are given a topic and have 20 minutes to prepare to debate with a partner. ​Debate with a partner on a different current event every month. Cross-fire cross examination is a crucial part of the round. ​Individual debate on the moral issues of the day. The topics changes every other month. Debate with a partner to advocate for and against a resolution that typically calls for policy change by the United States federal government or security discourse. Affirmative teams generally present a plan as a proposal for implementation of the resolution. The negative will generally prove that it would be better not to do the plan or that the opportunity costs to the plan are so great that it should not be implemented. Policy also includes a period of cross examination. The San Diego Imperial Valley Speech League (SDIVSL) ​serves high schools in the counties of San Diego and Imperial Valley as the regional league of the California High School Speech Association (CHSSA), and is dedicated to the integration of speech education into high school curriculae which will empower students to be productive participants in American society and the global community. The ​California High School Speech Association (CHSSA) is a non-profit, all volunteer association comprised of over 300 member schools throughout the state of California. Volunteer members include teachers, speech and debate coaches, parents and community members. The Logos Forensics Association (LFA) is a debate league created for private Christian schools. Unlike many other high school debate leagues, the LFA is founded by a Christian non-profit that is committed to building character and a biblical worldview in high school students. We hope to do more than just create competitive students – we hope to create the next generation of Christians who will represent Christ in every field.